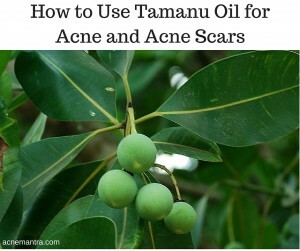 In this article, you will learn about using tamanu oil for acne treatment and fading acne scars. You will also find top brands of tamanu oil that can be used on the skin. There are many oils that claim to have great benefits for your skin, especially with the treatment of acne. Tamanu oil is among the oils which is said to help not only clear up acne but also to treat and fade acne scars and other spots on the skin. Reviews about this oil are pretty mixed, and it seems that the results are also a bit mixed depending on your skin type, although there can definitely be benefits from using tamanu oil. Tamanu oil comes from the center of tamanu nuts, found primarily on islands such as Vanuatu and Haiti. The oil is extracted and used for a large assortment of skin ailments. It’s highly praised for its ability to cure a lot of topical skin fungi and infections as well as helping skin to heal faster from scrapes, cuts, and other injuries. For acne purposes, it’s best to use cold-pressed, organic, unrefined tamanu oil as it will be the highest quality and will have a larger amount of the original healing properties than highly processed oil. Tamanu oil should be stored in a dark glass bottle out of direct sunlight. This oil is rated at 0 on the comedogenic scale, which means that with normal use it has a very low chance of causing clogged pores. Non-comedogenic oils are the best for facial use as they usually do not make the problem any worse, even if they don’t work well on your acne. There are many different ways to use tamanu oil, most of which are topical, but the most attractive to many people are the use of tamanu oil for acne and scarring. Not everyone has been able to successfully use this oil for acne treatment, but it does seem to show positive results in a lot of people’s skin. A lot of people use tamanu oil for treating their acne. You can use it straight in small amounts or you can blend it with other oils or a carrier oil. To learn more about blending oils, head over to this helpful guide here. It’s easy to learn how to use tamanu oil for acne. Simply take a small drop, no larger than a pea, and spread it evenly across your face. Don’t load the oil on, as you want it to soak in well and not leave excess residual oil on top of your skin. Some people use oils like tamanu with an oil cleansing method or as a moisturizer. This can work well, depending on the type of skin you have. Many people with sensitive, acne-prone, or dry skin have not found these two methods successful. If you have any of those skin types, you may be able to apply tamanu oil effectively or it may worsen your acne. It’s worth noting that tamanu oil has caused breakouts with some people who use it. This can happen for a variety of reasons such as using it on the wrong skin type (sensitive skin, acne-prone skin, very dry skin, or a combination), buying a low-quality product, improper application, or just bad luck. Overall the reviews seem to be more positive than negative, with even the negative reviews saying the oil makes your skin feel soft and firm. Another bit benefit from tamanu oil is its famed ability to fade acne scars and other marks away from your skin. Judging by the experience of many people who have used this oil, it does work for fading scars, although it takes time for the results to show. After around 2 months of use you should be able to see a noticeable difference in your red acne scars. To use tamanu oil for acne scars, you need just to apply the oil in a small amount over the affected areas. You can apply it to your full face to get some of the other benefits at the same time if that interests you. This oil is best at lightening red acne scars and reducing inflammation around your current acne. One of the nice things about this oil is that you don’t have to worry about your skin when you go out into the sun. Some treatments that lighten your skins make your skin very sun-sensitive, but tamanu oil does not. It can lighten scars while actually making your skin firmer and healthier. You can use tamanu oil for almost every skin ailment you can think of. While you’re applying it to your face, you can also try it on stretch marks, small injuries, fungal infections thick calluses, and other topical skin-related problems. If you’re interested in a more complete list of the benefits you can receive from topical use of tamanu oil, you can check out this page about it. TOP BRANDS OF TAMANU OIL IN THE U.S. This is one of the most highly recommended brands when it comes to many topical application oils. You can get a bottle of tamanu oil from Majectic Pure that is unrefined, cold pressed, and organic. It even comes with a convenient dropper for application. This oil comes from Madagascar, another major producer of tamanu oil. It has no additives and is 100% pure tamanu oil. Highly rated by customers on Amazon.com, this brand of tamanu oil gives you a 30 day money back guarantee if you don’t get the desired results from the oil. 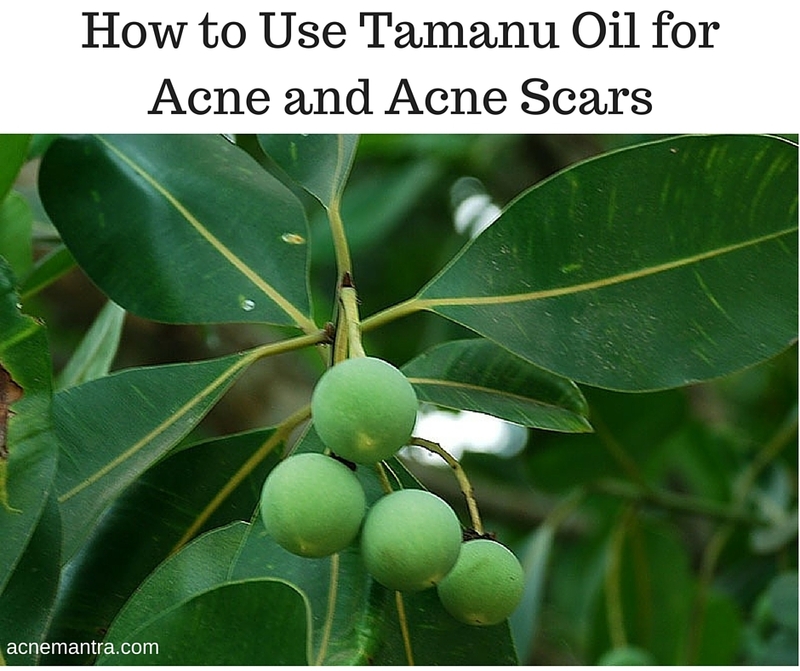 Tamanu doesn’t work for everyone, but enough people have seen benefits when they use tamanu oil for acne and acne scars that you might try it also if your current routine isn’t working out for you. Even if it doesn’t eliminate your acne completely, it might reduce the redness and help to make your breakouts more manageable and your skin softer.